How to manage your demand generation activities and your sales pipeline with Revenue Performance Management with Eloqua. 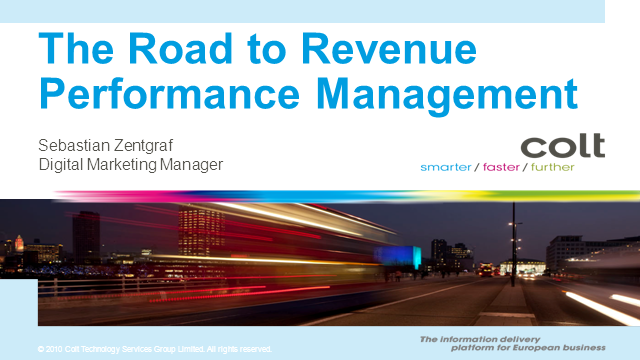 Revenue Performance Management, or RPM, is quickly becoming the hottest buzz phrase in the marketing automation world. At its core, RPM is a strategy to break down the silos between sales and marketing and achieve 'One View of the Truth'. Only by sharing a single view of the key levers within the sales and marketing funnel will a company start to truly outperform the market. During this presentation Colt Technology will describe the their journey to RPM. Learn the milestones, the drivers and the correct turns they took and you will have the directions you need to begin your own road trip to success.